At the heart of global development is the question of sustainability. How can we ensure that our investments in emerging economies have a positive impact beyond the end of program funding? Development programs funded by institutional donors or foundations tend to have a limited lifespan – three or five years, for example. After that, the program closes. Global development organizations often cannot go back later and study what, if any, long-term impact the program may have had. In some cases, Global Communities is in the unusual position to work in one place for long periods, seeing the long term impact as it evolves. For example, we have worked continuously in Honduras for 31 years and have had an ongoing microfinance institution in Gaza for 22 years. But now, in conjunction with an activity funded by USAID, we had the unique opportunity to go back and look at how a cooperative housing project in Poland that ran from 1991-2000 has evolved. Twenty-six years after the program began, and 17 years after it ended, what did we learn? Global Communities (then CHF International) began work in Poland in 1991, when the country was in transition from a Soviet-style, centrally planned system to a free market economy. Many aspects of life in Poland were undergoing rapid change, including the housing sector. Traditionally, housing cooperatives existed in Poland, but in the form of block-style apartment complexes that were so large and impersonal that people didn’t have much say in the organization or operation. Combined with the often-shoddy construction of these large, oppressive-looking apartment blocks, it seemed like the days of Polish co-ops would be numbered. We wanted to see if we could help cooperatives re-establish themselves as small, democratically run organizations, capable of delivering housing that Polish people actually would want to live in, while simultaneously addressing privatization, finance and housing supply — all issues that were emerging in the new economy. Building from the base of an earlier CHF pilot program, we began the Agency to Support Housing Initiatives (AWIM, the Polish abbreviation), a training program which expanded the capacity of local facilitators to form businesses that help create and maintain housing cooperatives. By the close of the program in 2000, 1,140 new housing units in 33 communities had been built, or were in the process of being built, with an estimated 4,560 individuals benefiting from these new homes. There was a special focus on the construction of single family and townhouse style homes that would be more appealing than the old apartment complexes. Thirty-four percent of these units were financed with mortgages issued by local banks, helping strengthen local lending institutions and facilitate a market for housing. These results were impressive. But what had been the impact over the ensuing 17 years? It would be expected that the positive effects of AWIM would dissipate over time. But when we checked back in 2002, we saw that of the 32 original AWIM businesses, 10 were active and building, with some even expanding their operations to include areas, such as cooperative and condominium management, real estate sales and building public housing. Fifteen years later, four AWIMs still produce housing units. Of the cooperatives created, some continue to manage the assets, some transformed into homeowner’s associations, while others dissolved after the closing of construction and switched to individual ownership of units. This longevity of both AWIM businesses and the cooperatives they helped create, relying on deep roots in their local environment as opposed to outside support, is truly commendable. Long after CHF ended its work in Poland, these institutions continued, serving their communities and helping fuel long-term economic development. As of 2017, AWIMs have been instrumental in facilitating 3,856 housing units (including 2,178 cooperative units) throughout Poland, housing an estimated 15,424 people. Malgorzata Lyko, an engineering student who worked in the construction field in the early ‘90s, began working with CHF in 1994 as a trainee. 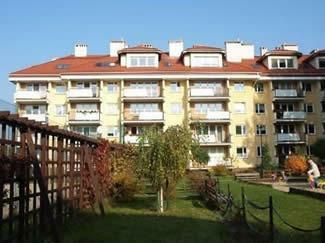 Since then, she has established several housing cooperatives in the community of Bielsko-Biala. Barbara Kowalska, a civil engineer, helped work with cooperatives, condominiums and communal housing projects in Gdynia until 2012, when she began working directly for the city of Gdynia as coordination director for the Department of Roads and Parks, where she still works today. Dorota Wielgus, an economist who “learned on the job”, runs AWIM-Tarnow today. Six facilitators also continue to work in construction services, and some of them have gone on to become senior local officials. We did not know at the time, but we were providing training for future civil servants. By training these individuals and helping them achieve success, the project helped set the goals for Polish communities throughout the housing sector. As one facilitator, Barbara Czarnecka, recently said, “We played a role in raising professional standards in the industry.” In the case of an emerging economy like Poland, the role of such standards and norms cannot be underestimated, and 17 years later we see the impact AWIM has had on a critical sector of Polish life. Sustainability is not always what you expect. People evolve as the environment changes around them. Poland has been through many changes since 1991 and the people we partnered with have made rational, educated decisions that are right for their country. Looking back at this project helped us to understand not just program outputs, but the holistic impact that this kind of partnership can have long-term. Sustainability is not measured in houses built, managed and still standing, but the institutions built or strengthened, and the individuals and how they evolve to build not only their own futures, but that of their communities. Read more about the results of the housing cooperative program in Poland. This post was originally published on December 12th, 2017 by David E. Weiss on the Huffington Post.